BIrch 100% postconsumer recycled paper cardstock. 105 lbs weight and 8.5x11 inches. You can print 4 direction cards or reception cards on a sheet. Handmade (printable) white silk and cotton rag paper rsvp card. You print 4 on a 7 x 10 inch sheet and cut, if you do the printing. Comes with A1 size recycled white 4 bar envelope. **Please Note: Only 50 sets left in stock and then this design is no longer available. Very similar to Seedling Design, which is a plantable invitation. Thanks! Eco Letterpress Booklet made from beautiful white handmade silk and cotton rag paper. Letterpress printed cover in spring green. Booklet is diecut and scored, with a handsome pocket for rsvp set or enclosures. Bound with natural paper raffia. (holes diecut) Booklet style invitation sheet - perfect for 2 language wedding invitations. Please Note: We upgraded the envelopes for 2010 to 100% Crane Lettra cotton envelopes. We also switched the interior printable from the silk and cotton handmade paper, to the Crane lettra 100% cotton rag paper. Approximately 2% of our customers last year, had trouble printing on the silk paper. We do have the silk paper in stock, if you want to use it. Please call us when you order, and we will adjust. Thank you! Modern landscape design. Luxurious materials for a rich look and feel. Mails completely flat in an A7 size envelope. 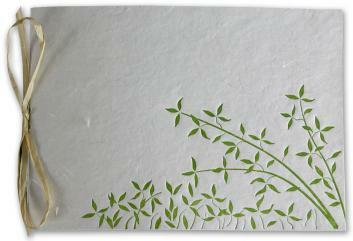 Beautiful handmade paper with original design letterpress printed in spring green ink. PAPER FACTS: Portfolio wrapper made from recycled cotton rag and silk handmade paper from India. Diecut and letterpress printed here in Pasadena. Inside invitation sheet made from cotton rag paper, made in USA. Envelopes made from 100% cotton paper, made in the U.S. Envelope: 100% cotton Crane Lettra paper envelope. Colors:White, Green and natural raffia. Invitation Sheet:White cotton rag paper. Prints laser or inkjet. Wrapper: Handmade paper booklet - diecut and scored with pocket. Letterpress printed art. Envelope: Bright white 100% cotton A7 standard size. Tie:Half yard of natural gold mulberry paper raffia.